EnaiSiaion for Summermyst and so many amazing mods! Alex9ndre for the Wintermyst patch that I used as base to create this one. -Fixed the weapon list to contain only the working weapon enchantments available in Summermyst v3 including the new one(Death's Door). -Fixed the Body, Feet, Hand, Head and Shield Lists to contain only the working enchantments restricted to which armor types they belong to. This is completely different from the old version of this patch that gave enchantments to item types restricted in Summermyst v3. -Removed all enchantments from the Armor List and only added Increased Experience enchantment, the only one in Summermyst v3 allowed on all kind of item types. This mod is just a small patch for Summermyst and Loot and Degradation. It works just like the Wintermyst patch made by Alex9ndre so that Loot and Degradation will distribute Summermyst enchantments to NPCs' Armors and Weapons. appear just fine), that is doable but one would need to add a couple hundreds lines to a Loot and Degradation's scripts, too much work for a minor feature. Besides, whenever you disenchant these items, you will learn the enchantment name correctly, just pretend that you're identifying some unknown enchantment. 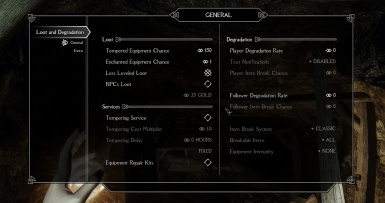 In the Loot and Degradation MCM menu use "Less Leveled Loot" with a value of "1" for higher rarity of the enchantments. Summermyst - Go endorse it! Loot and Degradation - Go endorse it!